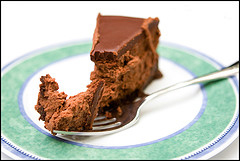 If you love cheesecakes, then this Chocolate Cheese Cake recipe is for you! I've made this recipe so many times that I've lost track, and it's never disappointed me. What's better is that my dinner guests are always clamoring for more! So here's my contribution to all the chocoholics and cheesecake lovers out there. This recipe combines the best of both worlds and is the BOMB! Thanks to Christine for her photo. We're always interested in hearing how this chocolate cheesecake recipe worked out for you. Or if you've got a similar recipe that you'd like to submit to us just click here! Combine cookie crumbs, cinnamon and butter and press this mixture into the bottom of a 9-inch springform pan. Bake 8-10 minutes or until set. Remove from oven and cool. Mix together the cream cheese and sugar until well blended. Add in flour. On low speed, add the eggs, one at a time and blend. Blend in the chocolate and vanilla. Pour over the prepared crust. Bake at 425°F for 15 minutes, then lower the heat to 300° for an additional 45 minutes. Turn the oven off, but leave the cake inside for another hour. Remove from oven and cool completely. Refrigerate until serving. Now....here are some helpful tips for cheesecake success!